Tonight Bayern Munich are hosting RB Leipzig at the Allianz Arena. This Bundesliga match is going to be one of the central matchups and our experts have already made up their predictions. According to the current standings, this season has been far from outstanding for Bayern Munich. Right now, they can only boast of their 3rd spot in the Bundesliga table, having won only 30 points in their last 15 matches. And although Bavaria has seen some success in European Championships when they reached the Champions League playoffs last week, the club shown a poor performance in both defensive and attacking play throughout the group stage. 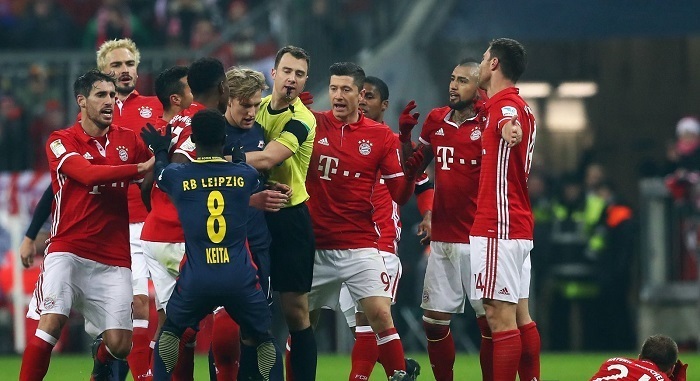 While Bayern is considered to be an unconditional favorite in the upcoming battle with Leipzig, the coaching staff and the players themselves are probably well aware that this will be a rather difficult match. Before this skirmish, Bavaria managed to clinch a relatively easy victory on the road over Hanover (0:4), giving the Munich players a much-needed confidence boost before their match-up in Leipzig. With almost no injuries or suspensions, Kovac’s men will be able to field their strongest possible squad in the upcoming clash. Leipzig are currently playing much better in the Bundesliga than in the previous season. For the time being, they are in the 4th position in the German championship, having gained 28 points in 15 skirmishes. However, the “bulls” failed to show their best football in European championships after an exit from the Europa League in the group stage following last week’s tie to Rosenborg. At any rate, the RB Leipzig footballers are now most likely focused on the upcoming duel. This is to be expected, as getting the three points in this match would most certainly improve the team’s standings. As for Leipzig’s technical skills, the team practices attacking football and scores rather frequently, but their defense leaves much to be desired. Their ratio of scored to conceded goals in the Bundesliga (2:1) is a good indicator of this. Spurred on by their previous victory over Mainz with an impressive score of 4:1, they are confident that they can put their best foot forward in the next match. Obviously, they are mentally and physically prepared to beat their opponent. Although Bavaria are still experiencing defensive issues, they have greatly improved their attacking skills. Leipzig have a similar problem – they simultaneously score and concede a lot. Both teams consistently scored in 2 of their last 3 meetings. We are eagerly awaiting a fantastic clash, the final result of which will be extremely important for both teams. Neither Bayern Munich, nor RB Leipzig will sit back in their half of the field, as we predict that both teams will score at least one goal each.